Discouraging, isn't it? I have been struggling as well so I can totally appreciate how you feel. Mind you I did fall off the band wagon, as they say... But surely it will start to work again as long as I stick to the plan. 2 1/2 weeks into my 10 months and I finally lost a pound. I have been doing a lot of yo yo . Went up 4 lbs after the 9 month weigh in and I finally got them back off plus 1 . Surely water but still drives me nuts. I don't even know what to aim for anymore as far as losses in a month. What is reasonable at this stage ? I was crushed when I dropped down to 6 the last two months and this looks like it will be half of that at this point. I will still keep plugging away regardless. I just didn't expect this much of a slow down before my year. Weight loss gremlins messing with your head. Just stick to the plan, consider upping your exercise a bit and see if any carbs you don't really want have crept it. I started making my sourdough bread again around Thanksgiving last year and if I don't really limit the amount I don't lose weight, even if my calorie counts for the day are about the same. A couple of nights ago I mentioned that I was up a couple of pounds and my Perfect Wife commented that I was slipping back into bad old habits, which in my case is snacking after dinner. Old habits die hard... and require constant vigilance. Am looking forward to summer and getting up at dawn to get some cycling in then. If it helps at all, there is some evidence that people who lose weight after WLS more slowly with an higher caloric intake may have a higher metabolic rate, e.g. metabolic set point, at the end of the day ( @Aussie Bear just posted on this). If that's the case then in the long run the loss you have will be more easily sustained. If you actually give up on having a specific goal for loss then you will be happy with whatever you have. (Sounds very Taoist, no? "A good traveler has no fixed plans and is not intent upon arriving.") so if you have no fixed plans for loss you'll have a good journey! Thank you @Ladybugzzz86 and @BurgundyBoy. I am pretty happy at this point. I had an NSV this week and it has made my month. ( I got into a pair of Eddie Bauer size 14 that I had kept from 9 years ago.) I always said if I could get back into those I would be happy and I was able to do that this week !! I am still 10 lbs heavier than I was back then but I am getting close. @Ladybugzzz86 lots of up and downs but you are correct we just need to stick to the plan and we will get to where we are going. Woooo! That's great, Tracy! I can't fit into my BFF's size 14 Eddie Bauer's yet (damn it!!) ... I guess that's what 3 extra inches of height can do for you! All my weight is squished down more so I'm wider in all the important pants places! Old habits die hard... and require constant vigilance. Re:"couple﻿ of nights ago I mentioned that I was up a couple of pounds and my Perfect Wife commented that I was slipping back into bad old habits, which in my case is snacking after dinner. Old habits die "
I just wanted to let people know who may look at this page, that in spite of all the struggles I had in the beginning of this journey that I did lose 80% of my extra weight. I remember feeling like it wasn't going to happen when I only lost 3 lbs that first week and 14 lbs the first month. 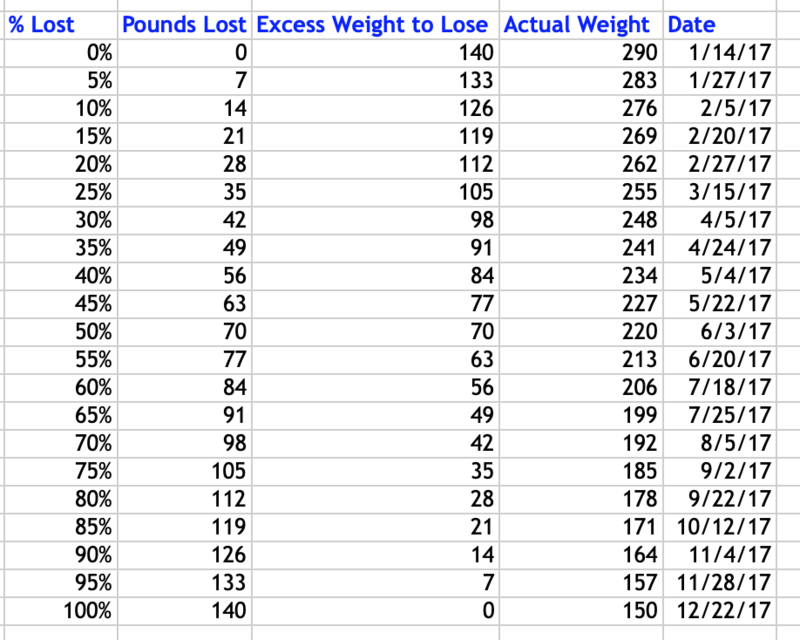 I did consider myself a very slow loser compared to others who were losing 20+ pounds in there first month, but like @Jen581791 had said it all added up. Stick to the plan and you will lose the weight !! Ahh, the journey is long from over! There are so many things left to try. Read @BurgundyBoy's suggestions above, they are good ones. I'm 13 months out and more often than not my body rarely lost weight how I expected it to. 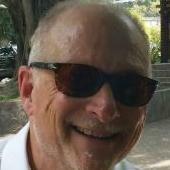 What I found worked for me was staying focused on protein first, then drastically reducing carbohydrate intake and shortening my daily eating time window as well as going for 20-30 minute walk 3-5 times a week. Shortening my eating time window lengthened my over night fasting time window and between that and reducing carb intake my surgeon measured a higher metabolic rate for me. That means my metabolism increased well over where it was pre-op. You will find what works for you! At 9.5 weeks I had lost 26 lbs and weighed in at 270.8. I kept a journal and still do. This is my entry that day ….. So sick of this already !!! I lost 1 pound this week FINALLY but than again I lost nothing !!! GRRRRRRRRRR. Boston I hated hearing people tell me to stick to the plan because they were already at goal, lol. It is true but they were right.. You can not give in or give up. At some point in my journey I would not lose weight for 3 weeks at a time doing everything right, then the drop would come. I just stuck to it like it was my last chance and truly it was for me. You can do this, one day at a time. You are worth it. At 9 weeks 3 days, I was down 25.6 lb so you got me beat. You're not doing anything wrong - you have averaged a 2.9 lb a week - that is excellent! If it's any help, every single diet I tried pre-WLS (and it spanned well over 30 years) was sabotaged by what I perceived as a failure the moment the scales recorded zero loss. When I had my WLS, I decided not to have scales in the house - I relied upon surgeon/NUT visits for my weigh-ins. Not for everyone but it allowed me to focus on the importance of following the programme and exercising (even if it was just a walk and/or yoga or pilates) every single day. I agree with Cinwa; I ditched the scales first off. Hubby hid it and took it out once every other week. In my past life if I didn’t lose anything I said forget it and went back to eating what I wanted. Have you taken before measurements? Often when you aren’t losing pounds, you are losing inches. I measured everything (wrists, thighs, calves, neck..) and measured once a month and could see the inches getting smaller. And yes, stick to plan, it will come off. One step at a time. Each step adds up. 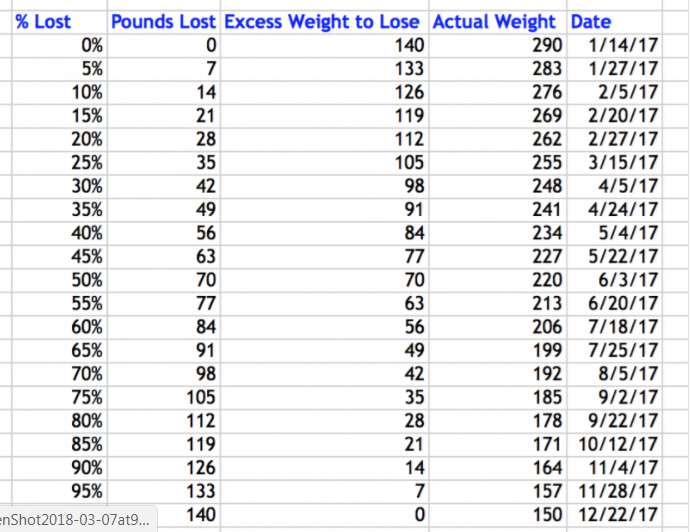 I looked up my history, and at 10 weeks I had lost 31 pounds, so very close to your story. This is just your beginning! All these people with big losses did it over a long period of time. I kept a scale, but only wrote down my weight once per week after my "real" weigh in. Keeping a weight loss table by week with a space for every 5% of excess weight really helped me keep the bigger perspective. Below is a table that a TTF hero shared (I think @msmarymac or @Jen581791), and it was really helpful. I made my own and filled it in along the way. You're doing great, keep it up!! BR, your body is going to lose both pounds and circumference... but the rates are not going to be identical. Like @tracyringo, a lot of my loss happened in big steps: no loss of pounds (though I was shrinking) and then I would lose 5 lbs in 5 days.... and then be at that weight for weeks before I had another "step" loss. It was as if my body, thinking we were living through a famine, kept holding on to everything that it could, and then sigh, and let the weight go. Yup, that was me. Here are my tables, just for anyone who is curious. Now I'm at GW and that may seem inevitable in hindsight, but it sure didn't feel like it for the first few months! It felt like it was taking FOREVER. One shot is my 5% losses sheet (it stops at 150 because that was my original GW - I'm more like at 135 now). 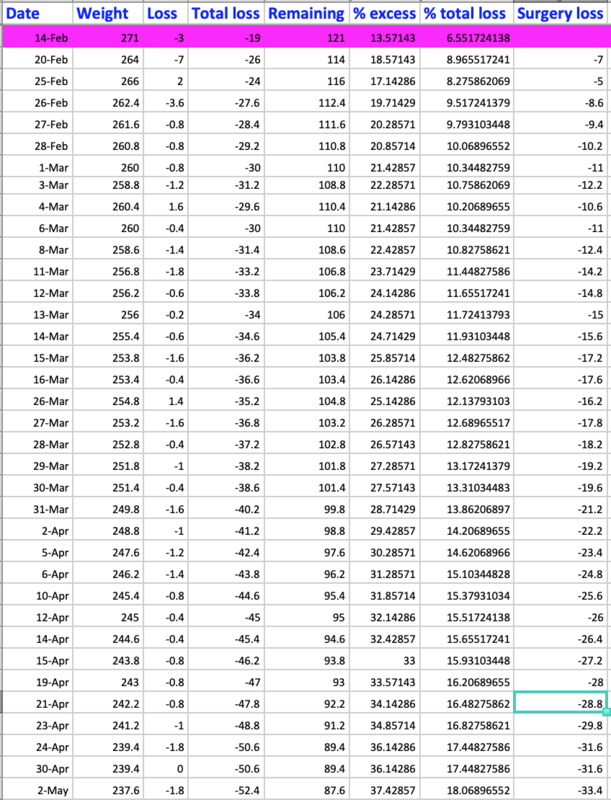 The other sheet is my total losses, measured every day, but just marking when the numbers went down. My losses were pretty consistent (again, in hindsight) compared with some others, but still felt like it was taking AGES.